Portable Comfort Going into extra innings is no problem for these cushions! 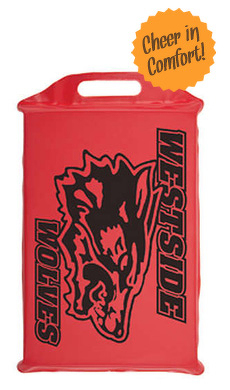 Looking for an affordable, effective promotional product for your business or organization? Look no more! Floating vinyl coated foam key tag with chain are great giveaways for current and prospective customers. Soft closed cell foam rubber key float is dipped in vinyl and completely sealed and coated with a shiny durable finish. Perfect for your boat, harbor, marina, or any water sport - will float your keys! Key chain measures approx 3-1/4" x 1-1/2"x 3/4" thick, with a large imprint area of approx 2" x 3/4". Key float available in 12 different colors.